The Least Sandpiper is the smallest shorebird in the world, and is usually found on inland mudflats or wet grassy areas rather than wading in water. It breeds in the North American tundra and in bogs in the northern boreal forest, and spends the non-breeding season in the southern United States and northern South America. In Tennessee, it is a common migrant and a rare winter resident, most likely to be found from mid-March through May, and then again from early July to mid-October across the state. Description: Unlike other small sandpipers, the Least Sandpiper has yellowish legs. The bill is dark with a fine slightly drooping tip, the belly is white year round, and the rump and tail are black. The back of breeding adults is scaled reddish brown and black, and the breast is heavily streaked. The back and chest of birds in non-breeding plumage is a relatively dark grayish brown. Juvenile birds (April-September) are similar to adults, but have a brighter more scaly pattern on the back. Voice: Fairly vocal and chatty on migration. Typical call is a high, trilled prreep. Semipalmated Sandpiper is very similar, but has dark legs, is more gray on the back and is less marked on the chest. The bill usually appears shorter and less drooping at the tip. Western Sandpiper is very similar and has a bill that is also drooped at the tip, but the bill is longer, and the legs are dark. It is less marked on the chest in non-breeding plumage, and in breeding plumage the back, crown and sides of the face are more chestnut-colored. Habitat: During migration frequents mudflats, wet meadows, lake and pond edges, and sandbars. Diet: Freshwater benthic invertebrates, insects, spiders. Nesting and reproduction: Least Sandpipers breed in the North American tundra, and in bogs in the northern boreal forest. They have never been documented nesting in Tennessee. Status in Tennessee: Fairly common migrant across Tennessee, and a rare winter resident. In spring, migrants start arriving in mid-March and linger through May into early June. Early southbound birds arrive just weeks later in late June or early July. A few birds may be found in almost any month of the year. The population appears to be stable. The Least Sandpiper is the smallest shorebird in the world. During migration, Least Sandpipers occur in smaller flocks of tens to hundreds of individuals, rather than in the thousands like some related sandpipers. Least Sandpipers forage at higher and drier edges of mudflats than other related shorebirds. On the breeding grounds, like many shorebirds, both parents incubate the eggs; the female leaves for migration before the young birds fledge (and sometimes before the eggs hatch); the males migrate leaving the young birds to feed themselves and migrate on their own in a few weeks later. Least Sandpipers migrates across most of continental North America, but eastern populations often fly nonstop 3,000 to 4,000 km from New England to wintering grounds in northeastern South America. Louis Jean Pierre Vieillot, a French ornithologist, first described the Least Sandpiper in 1819. 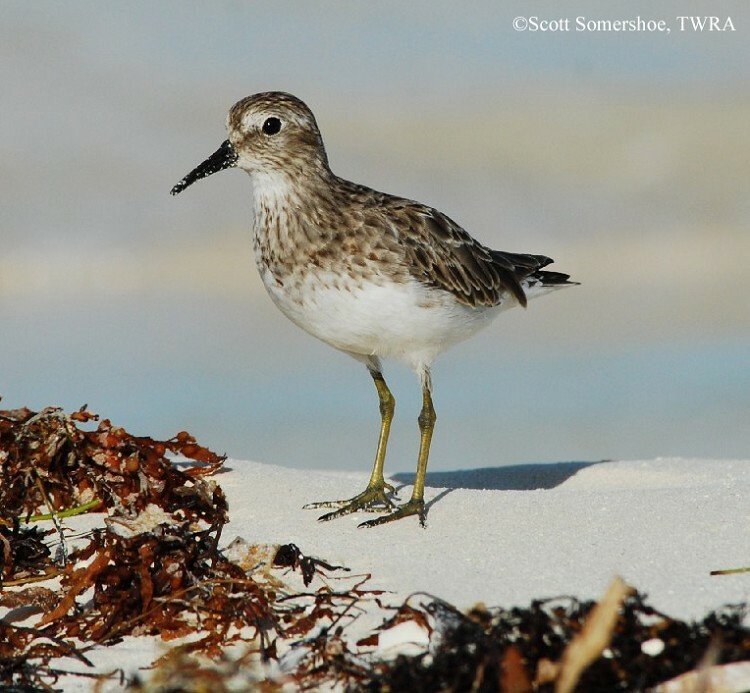 Best places to see in Tennessee: The majority of places that have shorebirds are likely to have Least Sandpipers in season, including Cross Creeks NWR, Old Hickory Lake, Island 13 in Lake Co., and Rankin WMA. Nebel, S. and J. M. Cooper. 2008. Least Sandpiper (Calidris minutilla), The Birds of North America Online (A. Poole, Ed.). Ithaca: Cornell Lab of Ornithology.